Green Zone is an exercise in commercial cowardice masquerading as a thriller about political bravery. A film at odds not just with recent history but also with itself, it's been filmed like an action movie but scripted at times like a sequel to Syriana. It's hard to imagine the testosterone set wanting to swallow so much half-baked commentary on American incompetence with their gunfire, chase scenes and explosions. Unless the studio's overt campaign to make people think this is an unofficial entrée in the Bourne franchise proves effective, Green Zone will open well based on star power and then do a fast fade. If the credits can be believed, Green Zone was at some point supposed to be an adaptation of Rajiv Chandrasekaran's multi award-winning Baghdad memoir Imperial Life in the Emerald City, a non-fiction account of American military and political hubris in the immediate aftermath of the Iraqi army's quick surrender back in 2003. Those were heady days for the Bush Administration, just before Iraqi political factionalism, a sustained and unanticipated guerilla war and the proliferation of roadside bombing made a mockery of George W. Bush's premature announcement of "Mission accomplished!" on the deck of the USS Lincoln. Afterward came the long and bloody slog that continues to this day. The book stuck to the facts and named names. Chief among them was L. Paul Bremer, the American administrator who, for one disastrous year, governed the seemingly conquered Iraqi nation with emperor-like powers akin to Douglas MacArthur's in Japan after WWII. Bremer's most notorious decision was to announce the dissolution by fiat of Iraq's defeated army, a brutal arm of the deposed Ba'athist regime, but also, according to books such as Bob Woodward's bestselling State of Denial, the only force with any hope of imposing order on a sprawling, ethnic powder keg of a country. Woodward's research indicated the vanquished military men were willing to make a deal. Bremer's sweeping decision therefore drove what was arguably the most heavily armed and highly trained Arab military force in the Middle East into a posture of violent resistance to American aims. The results were chaos, violence and quagmire, and they remain so today. Somewhere during the process euphemistically known as "story development," Imperial Life morphed into a queasy, self-righteous repackaging of hardware-worshipping thriller shtick and lone gun vigilante histrionics, served up with a dollop of liberal handwringing just large enough to convince the film's makers they're doing something "important," and maybe even courageous. Matt Damon is Roy Miller, a (fictional) warrant officer in charge of a unit tasked with finding weapons of mass destruction based on military intel from a (fictional) mysterious source. The intel is bad, of course, because as the whole world knows, Iraq had no WMD. This makes Miller hopping mad. So when a (fictional) informer tells him some (fictional) Saddam Hussein-era Iraqi bigwigs are meeting in a nearby house, Miller goes rogue and raids it, nearly capturing (the fictional) General Al Rawi (Igal Naor), an expert in Iraqi WMD. This puts Miller into conflict with the (fictional) Bremer figure, an unscrupulous ideologue named Clark Poundstone, portrayed by Greg Kinnear. Soon Miller is in cahoots with Brendan Gleeson's frustrated (and fictional) CIA maverick, a man whose bandsaw accent tells you just how ugly and toneless American English sounds to the Irish ear. Amy Ryan is on hand as a hack journalist who appears to have been based on disgraced NY Times scribe Judith Miller (it shows how desperate print outlets are for promotion that the Wall Street Journal has given this non-existent creature a byline in its film-prop pages). Ryan's function is mainly to provide a twist ending as visible as a scud missile, and from just as far away. Inconsistencies abound. Miller, who is initially defined as a straight arrow demanding clear answers from a world of murk, violates his oath of service so liberally he could easily be court-martialed five times over. He lies to his superiors. He withholds evidence snatched off a captured Iraqi. He fabricates authority to gain access to a high profile prisoner. He even guns down a fellow soldier-one the movie has defined as an ideological bad guy, so that's supposed to make it okay. Military viewers will be horrified. Hackneyed movie stupidities also flourish. Freddy, the Shi'ite informer who serves as Miller's translator, is the kind of quivering font of outraged dignity screenwriters frequently resort to when depicting ethnic groups they don't understand. (It could have been worse though-apparently, an early draft described Freddy as having a "penchant for Bryan Adams music," a character tag the finished film mercifully spares us). General Al Rawi, who is fat, middle-aged and visibly wheezing in some shots, outruns Miller and a pair of helicopters during a long, climactic chase scene that seemingly covers miles of ground. At one point, Al Rawi captures Miller, orders him killed, then leaves the room in true comic book villain style, thereby allowing Miller the inexplicable opportunity to leap up, beat down his guard and kill the man with his own gun. Worst of all is the way Miller is consistently allowed to zig-zag his way down the meanest streets on earth like a jogging tourist, presumably because his mission is a holy one, and his halo renders him invisible to potential enemies. This issues-driven film seems to have no idea how badly it undermines its ideological case with such routine implausibility. The credits say Green Zone was directed by Paul Greengrass, but don't you believe them. This is Seth Brundle's work-I'd know it anywhere. You remember Brundle-the technocrat in David Cronenberg's The Fly who wants to perform miracles but instead creates a monster of mutation. In Green Zone's case, the ill-spliced DNA is a hybrid of rogue cop antics, high tech chase scenes that fetishize a military the movie disagrees with and the shaky-cam aesthetic of the Bourne films, all grafted onto a brittle skeleton of limousine liberal messaging. 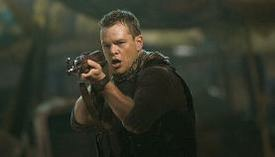 If Greengrass, not Brundle, was really the director of this movie, he would have sensed how setting Matt Damon loose in Baghdad like a helmeted version of Clint Eastwood's Man With No Name reduces contemporary political tragedy to mere fodder for sensation junkies unable to get to the next level on their Call of Duty video games. Greengrass, whose resumé includes not just the Bourne trilogy but also the superb, fact-based dramas Bloody Sunday and United 91, would have understood that by assigning responsibility for the American fiasco in Iraq to a fictional character he'd be negating his own point. And surely Greengrass, especially while working with the gifted screenwriter Brian Helgeland, would never have had the chutzpah to end a political fantasy with a Big Statement from its two-fisted protagonist about how the truth always matters-an aphorism Green Zone gives the lie to with every frame. A certain kind of filmgoer will find it easy to skim along the brisk, violent surface of this Brundlefly of a movie for a quick action fix, but virtually everyone will find its politics unmemorable and easy to dismiss. While that doesn't even register on any scale that includes leading a nation into war under false pretenses, it's still a kind of moral atrocity.